When teaching, it’s always interesting when you teach something that people know a lot about versus when it’s something relatively new. Using some basic facts quickly reveals what you’re up against. So if I asked the question, what has more ice the north or the south pole or which would create a largest sea level rise if it melt? Before I give you the answer, most people know a little more about the arctic and its polar bears because it’s closer and it gets more press. The Antarctic is the fringe at the bottom of the globe. Other than the recent penguin movies, it’s like another planet. People might know more about Mars than the South Pole. Besides we know where Santa lives. Well the real answer is that if the Northern Ice melts sea levels rise just more than 25 feet. If the Southern ice-melts sea levels rise 210 feet. Why the difference? Take a look at these basic facts. 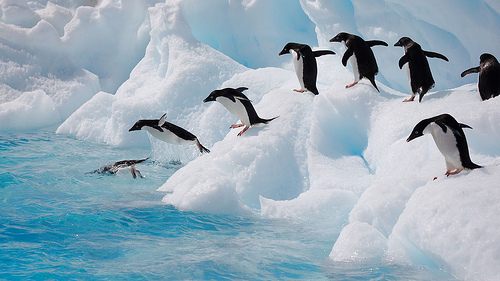 The Antarctic ice cap has 29 million cubic kilometers of ice. This is 90% of all the ice on the planet and between 60 and 70 % of all of the world’s fresh water. The cold and dry conditions in the “Dry Valleys” region of Antarctica are so close to those on Mars that NASA did testing there for the Viking mission. It has not rained in the dry valleys for at least 2 million years. Antarctica has the lowest recorded temperature; -90°C at Vostock in 1983. Inland, temperatures range from -70°C in winter to -35°C in summer. Corresponding figures for coastal regions are -30°C and 0°C. Is Blogging a Text Media? I see a lot of blogs that are very heavy text often just one long paragraph. While content is king, you have to do something to attract and keep people’s attention. Here’s a couple of things I’ve done to try an make my site more readable. I start with an idea and then go look for a picture that expresses the idea. In this post, I just wanted a picture to grab your attention. 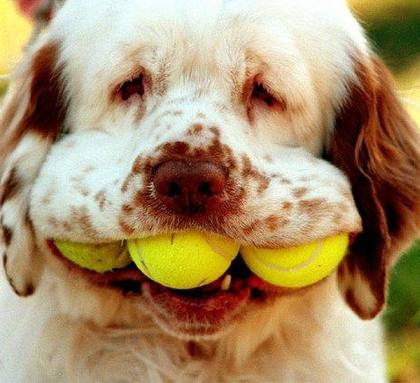 Nothing like a dog with three balls in his month. Then I try to get across my point in a series of very short paragraphs. I try to keep my post to something that you can read in just a few minutes. If I have more to say, I can always write another post. Also if you exhaust a topic, what are you going to write about tomorrow. Keep to your theme but don’t be too predictable. This blog is about learning so I always try to connect it in some way, but the range of topics is fairly broad. I also prefer a narrative style so it sounds like I’m having a conversation with the reader. Science is good at a lot of things. Predictions aren’t one of them. It’s still hard to pick a winning horse at the track. But this is just my observation so I did a little homework. Here’s an interesting article about the quality of scientific predictions. Try not to get caught up on what the prediction is about. That’s not the point. It’s about the ability to predict. Also I’m not talking about the ability to predict what happens when you mix two chemicals. I’m talking about predicting what will happen in a complex system like real life. There are a number of articles with this time of year that rank scientific accomplishments. I guess there still is more to learn. Here’s a link to one in Wired Magazine. I especially like the chimps that make spears.